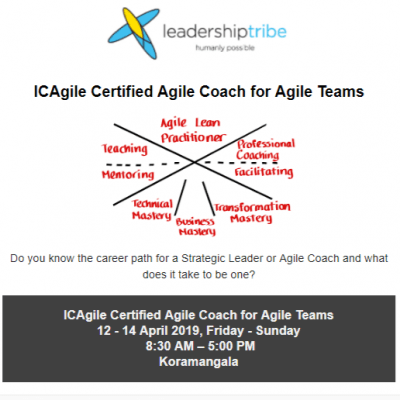 The course focuses primarily on the mind-sets, roles, coaching skills and responsibilities of an Agile Coach, and after successful completion of the course, you will be ICP-ACC certified. You will be able to differentiate between mentoring, facilitating, consulting, teaching and coaching, and acquire the knowledge and skills to create a safe environment for meaningful collaboration and healthy conflict resolution within an agile team. You will fully appreciate the team development concepts around starting and growing teams while paying particular attention to team dynamics and the surrounding organisational system. A key part of this course focuses on developing an understanding of professional coaching skill set and the value of honing these skills to serve individuals in an agile team. The course is developed for team leaders or aspiring team leaders with a passion for training teams and a desire to build a career as a Certified Agile Coach from Internationally Recognized Body. Relevant roles include Project Managers, Scrum Masters, Iteration Managers, Agile Coaches and Aspiring coaches, Product Owners, Analysts, and anyone with the desire to harness the power of coaching to train & support teams during the Agile Transformation. Is there a Fee to Renew ICAgile Certifications? No, ICAgile does not have a certification renewal fee. Our goal is to help people go on an Agile learning journey. Therefore, we encourage professionals to take the next step by pursuing other ICAgile certifications across the ICAgile road map.